These tostada crisps are so addicting and yummy! They were made using the leftover tostada shells from the Tostadas Rellenas con Carne Adobada recipe, although you could make them from fresh tortillas, roughly cut into triangles and bake them twice. Anytime we have leftover flour tortillas, this is what I do. 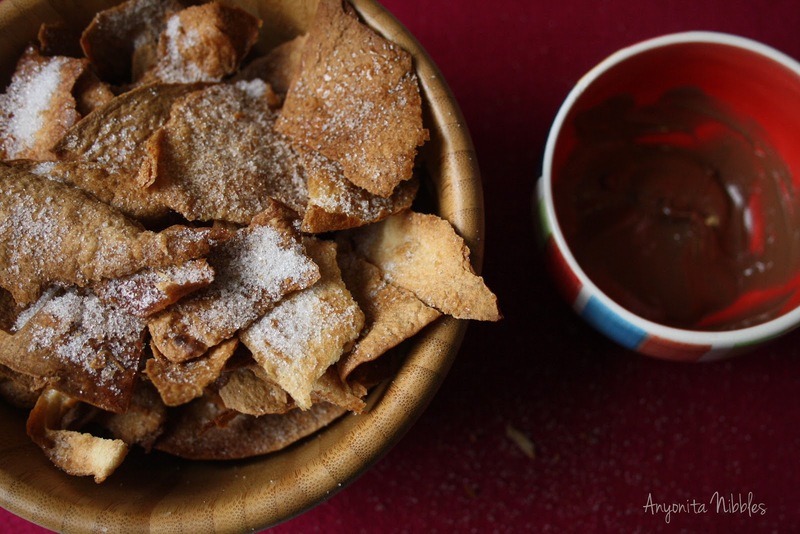 The topping is a cinnamon sugar mixed at the time of baking and I usually melt a small pot of chocolate for dipping. They're kind of like deconstructed, baked churros! Over on the left is the tostada shells before they were broken up and baked. After making the Tostadas Rellenas, I popped the leftover shells in a zip-seal bag and just left them out on the counter overnight and baked them the next day. 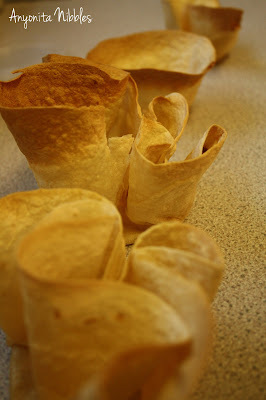 I'd like to think that they'd keep the same way after making the crisps, but to be honest, we ate these up straightaway and there weren't any leftovers. Combine the sugar, nutmeg and cinnamon in a small bowl or condiment shaker. 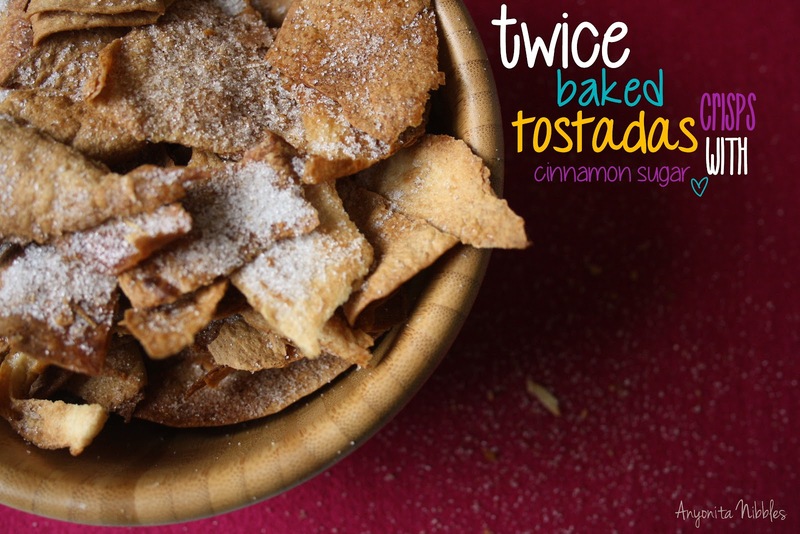 If using previously baked tostada shells, break the shells into rough, smaller shapes and arrange on a baking tray. 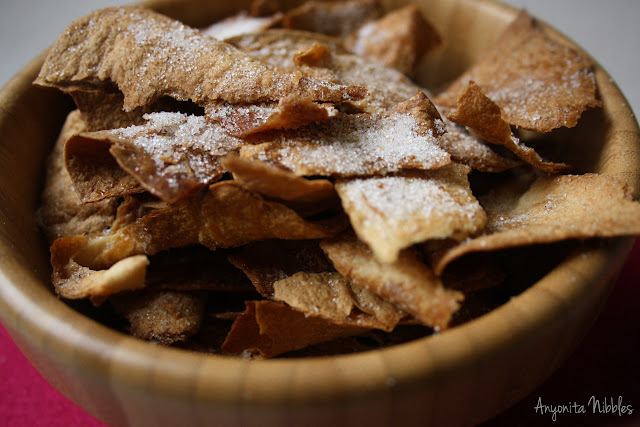 Remove from the oven, toss gently and sprinkle the remaining sugar mix over the crisps while still warm. Serve with melted chocolate. Mmmm, these look so good! Yum! I'm imagining them with a dollop of ice cream...oh, man!